This week I'm entering Sunita's Think Spice... event hosted by Aparna at My Diverse Kitchen, where you can read more about nutmeg. You can have a look at my recipe entry here. I also thought I'd write a little about nutmeg from an Ayurvedic point of view. Nutmeg has three tastes: sweet, astringent and pungent. It's heating post digestive affect imbalances Pitta, but makes it very useful for Vata and Kapha. It is especially useful for nervine conditions and as a sedative. Nutmeg is an expectorant, aphrodisiac and can expel parasites. It is also a stimulant and carmitive, aiding absorbtion in the colon. Do not use in cases of high pitta. Only use a pinch or two of nutmeg at a time. A little nutmeg with warm milk can help lower blood pressure and insomnia. Add some ghee to this drink for excessive Panch Karma and exhaustion. Since nutmeg aids absorbtion in the colon it can be useful for malabsorbtion, food allergies, anorexia or when recovering from diarrhea. Nutmeg with peeled, stewed apple can stop diarrhea, or for babies use a pinch of nutmeg with mashed banana or warm milk. Neurosis, anxiety and other general Vata nerve disorders will be eased by the addition of nutmeg to the diet. Small amounts of powdered nutmeg can also be applied externally for insomnia, athritis and headaches. Nutmeg is particularly beneficial where Vata disorders are combined with congested Kapha. The part of nutmeg we are all familiar with is the fruit of the plant, and not a nut at all. For the best quality and potency use the whole fruit, rather than buying powdered nutmeg. You can grate it fresh yourself on a special nutmeg grater or mill, often made of porcelain. I just use the fine side of my regular metal grater. Whilst some of us are more familiar with nutmeg in fruit cake or rice pudding, in Italy it is classically paired with ricotta, pasta or vegetables. I remember in high school some of the naughty girls used to bring nutmeg sandwhiches for lunch, claiming that nutmeg is a drug. It's unlikely any of them ever got "high" though, since it takes more than four teaspoons of nutmeg to experience hallucinations many hours later, and with unpleasant side effects. Still this spice, like all spices, ought to be treated with respect. That's right nudi, without clothing. But how does ravioli get to be naked? This is very traditional Florentine recipe, more than 600 years old. Ravioli Nudi is kind of like the filling of ravioli without the pasta, which means it's a lot simpler to make. My variation on the theme is without eggs and parmesan, not so traditional, but still very tasty. Although it takes some time it's a very easy recipe, but I suspect it would take many years of practice to perfect the art. This is my first entry to one of Sunita's Think Spice, Think... events, hosted by Aparna at My Diverse Kitchen. This weeks spice is nutmeg, which instantly makes me think of Italian food, and ricotta, one of my favourite ingredients. I'll post more about nutmeg here. I don't believe scales (the bathroom kind or the kitchen kind!) so my measurements are very rough. You'll have to use your intuition and a bit of common sense, but don't worry, I'll talk you through it. The ricotta for this recipe should be really dry. If the ricotta is quite moist drain in a cheesecloth or a fine sieve overnight, and then measure out the 2 cups. The time consuming bit of this recipe is rolling them out, enlist a helper (kids can do this easily) or allow yourself between half and hour or an hour to roll them. Start your water boiling early, it can take a long time. Be ready to serve them as soon as they are cooked, they will start to go hard as they cool. The amount of flour depends on the moisture in the ricotta and spinach, you may need a litle more or a little less. Make your dough as wet as you can handle it it. Place your spinach in a big pot and cover with a tight lid. Put on a low heat for a few minutes, stirring every now and then. When it is wilted remove it from the heat. It will lose some water, drain and reserve this liquid. Put the spinach leaves in a blender and puree (or you can chop it finely by hand). Put into a large mixing bowl with the ricotta and mash it all together. Add nutmeg and healthy dash of salt. Next add about 4 cups of flour and work it into a dough with your hands. Add half a cup of flour at a time until it reaches the desired consistency. This dough will be sticky, but just dry enough that it holds together, if it is too dry, the ravioli nudi will be hard and dense. If it too wet the ravioli will fall apart when you cook them. Flour your benchtop and wet your hands. Roll teaspoons of the dough in flour to coat them. You may need to wash your hands a few more times throughout the rolling process as the dough will be very sticky. Add them one at a time to the boiling water. Once the water comes off the boil don't add any more, wait for that batch to float to the top and stay there (about five minutes) and then remove with a slotted spoon. Then cook the next batch. Serve hot with olive oil, sage butter, more nutmeg, parmesan or fresh herbs. Don't drown these in sauce, they are good enough to eat alone. These are quite heavy to digest, don't overeat and serve with a side of vegetables. Vata and Pitta can enjoy this recipe without any problems, but it may be too heavy for Kapha. But what about the reserved spinach liquid? Save it as stock for soup, dahl or sauce, or just drink it! Don't throw it down the sink, what a waste of nutrients. I'm not a winter person, not by an stretch of the imagination, but one of the few pleasures of a winters day is a big steaming bowl of soup. Serve it with a spoon and I'll love it! My soup of the day is green. There's no recipe strictly speaking, you've just got to feel the love. Start by roughly chopping your vegies, anything green: celery is a must, zucchini, beans, brocolli, green capsicum, spinach, brussel sprouts, leek...whatever you've got. Plus chop an onion and a potato. Fry spices of your choice in ghee (mine are cumin, ginger and coriander), then before they burn add your onion, followed by all the other vegies. Throw a couple of handfuls of mung beans for oomph and a healthy dash of salt. Cover with water, cover with a lid and simmer till soft. Puree, add more water if needed and serve it piping hot. The potato makes it's unbelievably creamy, I could eat it every day. In fact I have been, and will until my husband gets bored and intervenes, though I suspect he's quite happy with green soup for awhile. I am fortunate to have spent the last week in London with my Guru, Shivarudra Balayogi. 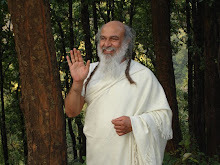 Having just begun my own collection of stories on this blog I have discovered he has just released a DVD in which he narrates the stories he learned from his Guru. I love stories and learn much better this way than through scriptures or lectures so I am very happy. One of the many stories he told to us in London was about happiness, a simple story which he heard as a child. He said when God created the world (metaphorically speaking!) God gave happiness into everyones hand. He said "This happiness will only work when you give it to someone else." Everyone gave their happiness to each other and the world was peaceful and harmonious until one day one person decided to keep his happiness for himself. Then the happiness stopped working. A variation on the story of Pandora's box. I tend to think great truths appear across all religions and cultures and communities, just couched in different language. The truth is that serving others is the only way to happiness. Whenever I eat in restaurants I spend most of my time tasting all the flavours and planning how I can replicate it at home, or worse analysing the meal and how I would cook it differently. It's a habit that I got from my father, and whilst I may not be the funnest person to eat out with it makes me better cook, saves me a lot of money and means when I do taste good food I can truly appreciate it. If I have to eat out I dream of going to a restaurant where the flavours are so subtle, so complex, so delicious that I can't work out how to cook it myself and wouldn't want to change a thing. I've been toying with the idea of going to somewhere a bit classy, but classy restaurants serve meat, and vego restaurants aren't classy. Don't get me wrong, there are some fabulous vegetarian restaurants, but they tend to be of the lunch bar or cafe genre, with hearty cheap meals like vegie burgers, big plates of noodles or curry and rice. And why do they always smother everything with garlic? I've been lamenting the lack of posh nosh for vegetarians. Then I came across this article which echoes my sentiments exactly. It gives some food for thought and some ideas of where to begin my gastronomic vegetarian adventures. I will retell this story word for word because I can, since it was written rather than verbal. It comes from Elizabeth Gilberts book "Eat, Pray, Love". "There's a wonderful old Italian joke about a poor man who goes to church every day and prays before the statue of a great saint, begging "Dear saint-please, please, please...give me the grace to win the lottery." This lament goes on for months. Finally the exasperated statue comes to life, looks down at the begging man and says in weary disgust, "My son-please, please, please...buy a ticket"." The moral of the story, prayer is very powerful, but you have to hold up your end of the bargain! We spent a few months in Cambodia living with my brother-in-law. We thought we had an arrangement with the coconut seller to bring his wares past our place every three days, but in truth he came whenever he felt like it, sometimes daily, then not for a week! And for all my months of effort, I could never pronounce the Khmer word for coconut "dong", even when I was pointing at one they still couldn't work out what I was asking for! I was extremely thin at the time, and attribute most of my healthy and much-needed weight gain to drinking coconut water daily. Coconut is cool, oily and sweet, it is very high in water (and more nutritious than water itself!) This water is in a very pure form, having been distilled through the root system of the tree, and is full of prana. Coconut is a very nourishing and life supporting food, and in Cambodia they talk of a man who lived for a year on coconut water alone. Coconut is sattvic. Best for Pitta and very good for Vata when care is taken to strengthen agni simultaneously. Coconut flesh, or meat, is hard and heavy, a bit more difficult to digest than the water. The older the coconut, the rougher the flesh. Coconut water is what spills out when you crack open a coconut, it's transparent, not milky. Only drink the water from fresh young green coconuts, by the time they are brown the water is no good. Coconut water is liquid and smooth. Drink it at room temperature, not too cold, and be careful not to overdose. It may extinguish agni altogether. Coconut milk is what you get when you soak or boil the grated flesh in water, and then strain it, kind of like making tea. You can make it with dessicated, but fresh is best of course. Canned coconut milk is of a dubious nature, but I love it and use it anyway! Coconut oil is used in Ayurveda mostly externally, though it is good for cooking too. Oil applied to the head eases anxiety, insomnia and hair loss. It also helps with Pitta relieving thirst, rashes, burns and burning sensations. Dessicated coconut is what most of us outside the tropical world have to settle for. The grated dried flesh is rough and should be taken it in smaller amounts or it will be heavy to digest. Drying food is a preferable way of preserving to freezing or canning. It can be soaked prior to use. So this is a little belated (5 months!) but my brother in law just announced his wedding date in Cambodia, so wedding fever begins again! I just thought I would share with you our wedding menu, nearly entirely cooked by family and friends on the morning of the wedding. I'm still impressed by them all, especially considering we had nearly 200 guests. All the food worked very well, we had a minor disaster with the rice cookers (never trust a machine!) but I didn't even find out about that till afterwards. Cooking for our own wedding was a part of the big day which I would never forego. Having all the woman over at my house grating carrots and peeling potatoes was a great sadhana, and gave the wedding such a timeless, community feel. Sigh, it makes me happy just to think of it. Everything you put in your body should be body temperature or above. Don't take food or drinks straight from the fridge. Don't eat raw food, not even salad, except for fruit, which still shouldn't be fridgy. Though Pitta can tolerate raw foods well when detoxing. Drink your water at body temperature or, better still, warm. This is because cold food interupts agni, the digestive fire.